negotiate a straight staircase with no turns, bends and landing . The stairlift stops at the landing. Another stairlift is required to negotiate the next flight of stairs. Smooth, quiet, works during a power outage, and present no risk from electric shock. Direct Drive Rack & Pinion.Motor/gearbox directly attached to drive mechanism - no separate gearbox, belts or pulleys - reliability, smooth ride. Folding Seat & Footrest . Minimises the space taken by the stair lift when not in use. Ideal when there are other users of the staircase. Overspeed Governor essentially prevents uncontrolled descent - no stair lift should be without one. It is a mandatory component in most countriesthough strangely not in the US. Motor/gearbox directly attached to drive mechanism - no separate gearbox, belts or pulleys - reliability, smooth ride. Overspeed Governor essentialPrevents uncontrolled descent - no stair lift should be without one. It is a mandatory component in most countriesthough strangely not in the US. No sudden, jarring starts and stops. Make sure it's an electronically controlled system. Mechanical soft starts don't work very well.Locking Swivel Seat essentially ensures safe mount/dismount of stair lift at top of stairs. Stair lift seat pivots and locks in position, so user can step directly off on to landing. interference.Locking Key Switch essentialDisables the stair lift to prevent tampering or unauthorized use. Not a gimmick - constantly displays stair lift status, by a system of lights or a digital display. The system allows the user and relevant tech personnel to determine the stair lifts operation and safety status. 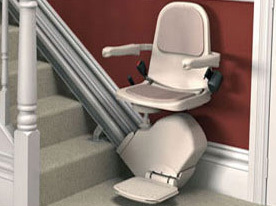 * This feature is essential if you are installing the stair lift yourself. This feature allows users who cannot bend their knees to use a stair lift. Also works well on very narrow staircases.Safety SurfacesStops the stair lift if it collides with any obstruction on the stairway. The lower section of the rail folds upwards and out of the way, in situations where the foot of the rail might otherwise cause an obstruction or tripping hazard. "How are you managing right now?" Is your situation likely to improve? Stay as it is? Or deteriorate? "Live on the ground floor of your home?" "What has stopped you from acting, before now?"